Flower, the freeloading box turtle hatchling who took possession of my garage lab on 14 November, has begun to practice magic. Waking as the first light of dawn poked through the oak leaf pile, under which she hides each night presumably from mythical garage owls, Flower plowed through her breakfast plate of chopped tomato, lettuce, mushroom and berries and sauntered across her makeshift terrarium. She paused for a brief stopover at her wading pool to wash out the night’s cobwebs, then zigzagged to the converted sushi bowl, which serves as her swimming hole. She slipped down a mossy patch, which subs as a safety ladder and spent the rest of the day lounging in her pool. When I checked this evening, Flower had rumbled back across the terrarium to her secret hideaway. And, amazingly, the entire sushi bowl was bare dry. Not a hint of moisture remained. How a quarter ounce hatchling manages to conceal a quarter cup of water indicates a level of magical power beyond mere mortal power to discern. On a New England crisp night when stars pop from the skyscape like alien spacecraft, one might be forgiven for an open-mouth doubletake on an unexpectedly close encounter of a very different kind. A big gray ET? Well, the color’s right. And the eyes look fairly Roswellian. Bouncing over the tinkertoy bridge, the jeep’s headlights captured a strange shape guarding the causeway approach to Lieutenant Island. 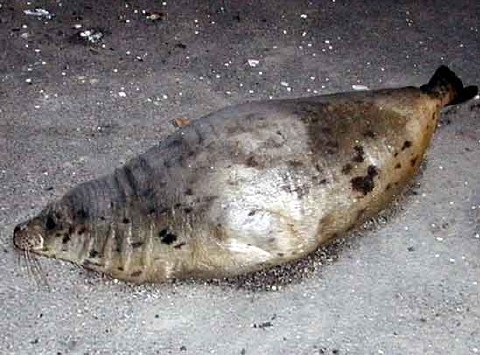 Colors blending perfectly against mottled gray asphalt dotted with splattered shellfish dropped by Wellfleet’s too smart sea gulls, a harp seal spanned the roadway. Had she not raised her head as the car approached, it would have been a close call whether or not she could have been spotted in time. Obviously well nourished, she probably slipped onto the asphalt causeway to soak up the remnants of a sunny day’s heat buildup, because radiational cooling under a dry, cloudless sky had begun to drive temperatures below freezing. And she wasn’t about to surrender her heating blanket without a protest. But with tire tracks bisecting her body, prudence called for her to skedaddle. So, despite her barking protests, I escorted this fair maiden into the abutting salt marsh, looking over my shoulder every few minutes to be sure no strange blinking lights appeared overhead. 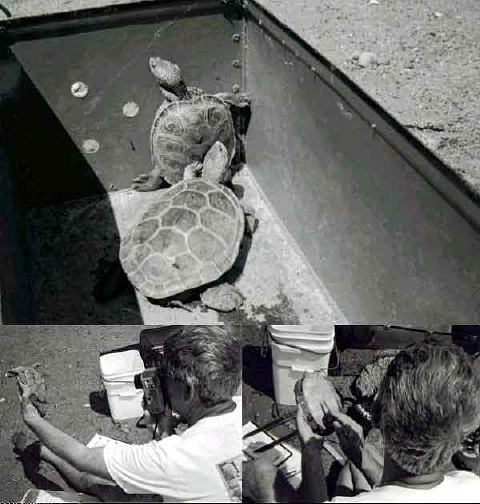 The terrapin field researcher faces a life of endless challenge. Hours spent in stuffy work clothes, cramped office conditions without even the simple convenience of a chair to lighten the load, total reliance on private conveyance with no public transit available, and not the barest shelter from warming sunshine and cooling bay breeze. Alas, a lonely, rugged life where a rock is your desk and the beach becomes your home. Yet, you can’t beat the company. Whether human or terrapin, only the friendliest, most photogenic and curious join the party. 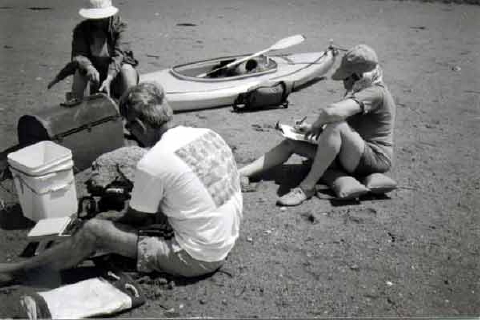 And, in the world of terrapin research, life is a beach. Although for some, I guess, they’d just rather be sailing. 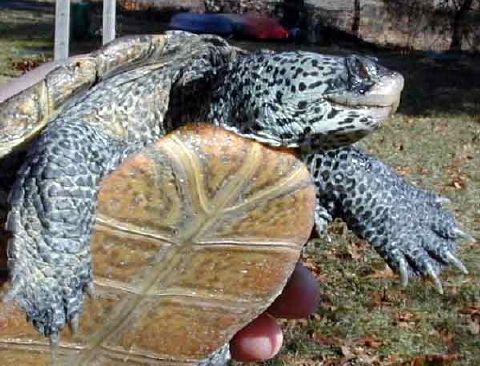 Yesterday afternoon residents spotted a 7–8 year old female terrapin plodding out of Chipman’s Cove, heading onto the beach. 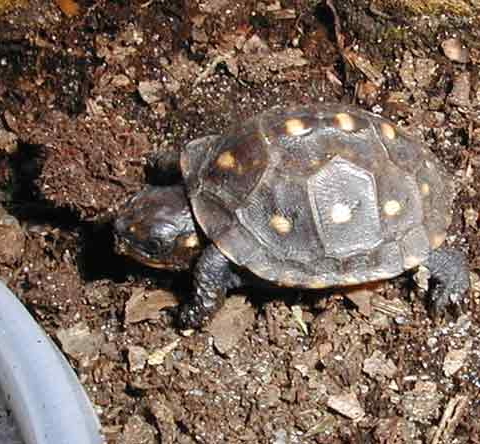 She is a still immature female less than 12.5 centimeters plastron length and weighing only 472 grams. She probably will not reach nesting maturity until the 2002 season. Still groggy, she sports the telltale brownish stains which indicates recent withdrawal from her muddy hibernaculum. 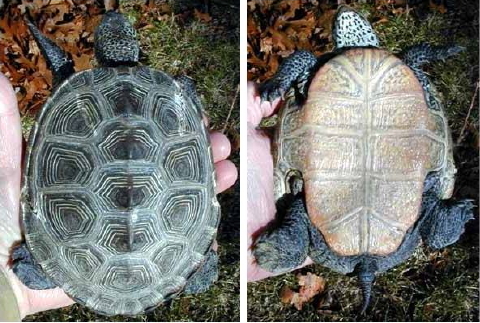 Now, February 6 is not the date one expects terrapins to begin sashaying around the shoreline, especially out here at the end of the universe. So, something unexpected woke her from slumber. Her right eyelid swelled from an abrasion and her carapace showed cracks and scratches which appear to have been caused by a raking instrument. (Yesterday brought an invitingly low tide for mucking on the tidal flats.) With no open wound nor bleeding, the best bet seems to be trying to induce her back into brumation. She’s being kept in a cool, dark, but comfortable environment, so with any luck, she can resume a well-earned winter rest. 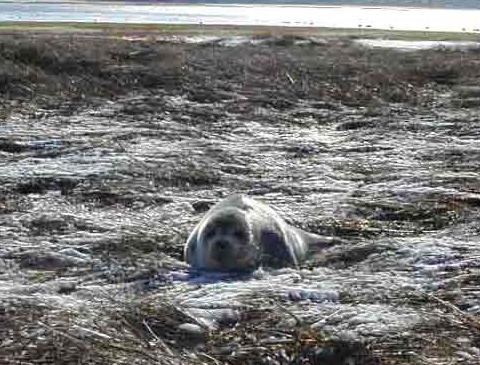 This morning’s adventure in the Land of Ooze uncovered another harp seal pup hauled out in the salt marsh. 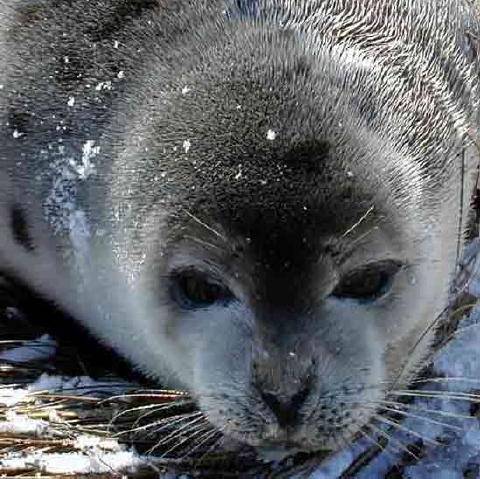 The number of juvenile harp seal sightings in South Wellfleet this winter has been quite amazing. 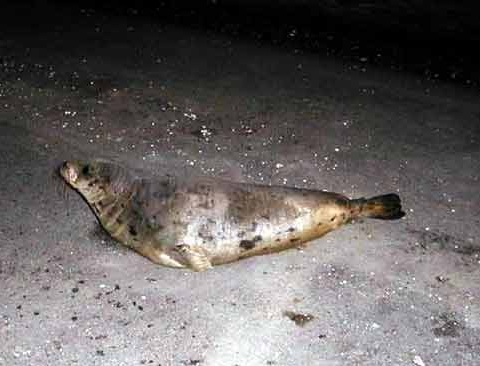 This fellow floated in with the predawn high tide and came to rest midway between the bay and Lieutenant Island’s southern shore. Healthy plump and about 2.5- to 3-foot long, he seemed quite pleased with this secluded hideaway. 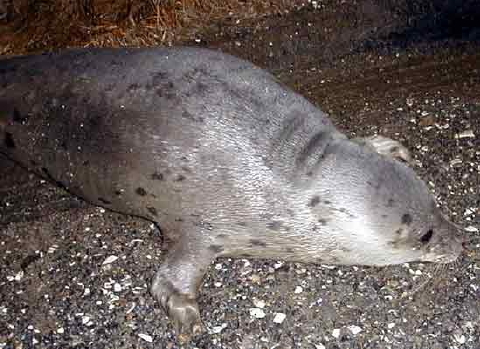 As we completed our patrol and headed back toward civilization, the seal resumed his exhausting sunbathing regime. Life is tough for these gorgeous critters, but someone’s gotta do it. 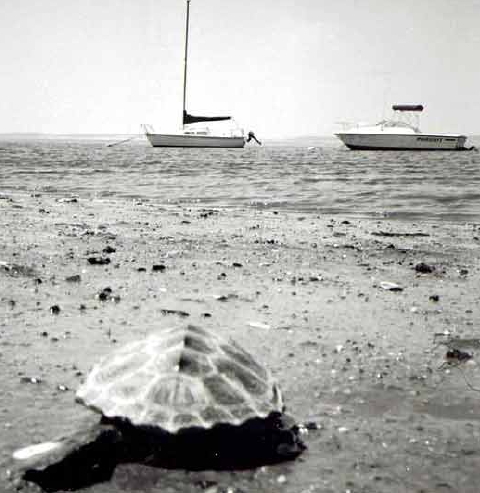 You are currently browsing the Turtle Journal blog archives for February, 2001.